Art of the solo arena entrance screen. 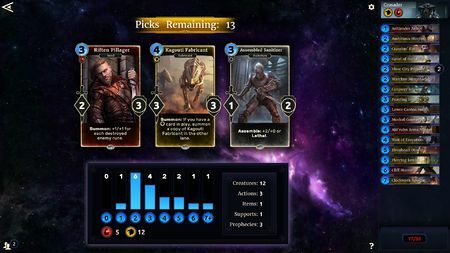 Solo Arena is an arena mode in The Elder Scrolls: Legends. Solo Arena consists of several consecutive matches against the AI. Rather than using one of your already-constructed decks, you choose one of three offered classes to play as, and will be given a selection of cards within that class to build a 30-card deck. The deck will last only through the remainder of the arena. Rewards from the Arena are greater than the rewards earned in Play modes, but lower than Versus and Chaos Arena. They may include legendary cards and multiple card packs. In Solo Arena, you face off against eight AI opponents and a final boss. The run will be over after you lost 3 times or if you managed to defeat the boss. When you enter the Arena, you will see a screen of eight small counters, with the image and class of the corresponding enemy displayed, and a large counter showing the avatar but not class of the boss. To the left of your name will be your Solo Arena rank and win counter, and to the right your loss counter. Battles in Solo Arena are much the same as any other; you select a counter and hit play. Every time you win a match, the enemy's corresponding counter is replaced by an image of a coin, and another win is added to your win counter. When you win, you are given one more choice between one of three cards. Every time you lose, the enemy's counter will display a red rune, and the same rune is added to your loss counter. Once you defeat all eight non-boss opponents, the class of the boss will be revealed and you will be able to battle it. You will receive an Adoring Fan card for defeating an Arena boss for the first time. 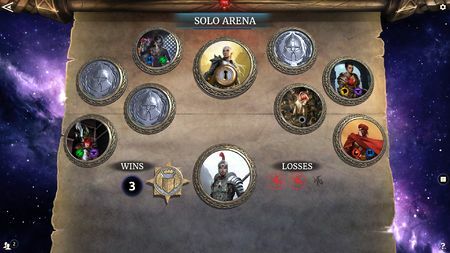 An image of the solo arena menu, showing defeated opponents as coins, the boss under a lock icon, undefeated opponents as their avatars, losses to enemies marked with runes, and a selected opponent with a yellow highlight. As with the Versus Arena and Chaos Arena, every time you earn a rank, you earn a promotion reward of fifty gold. You earn a rank every time you defeat a certain amount of opponents. Only seven wins are needed to rank up until you reach Hero. After this, the requirement to rank up is nine wins until you achieve the Grand Champion rank. 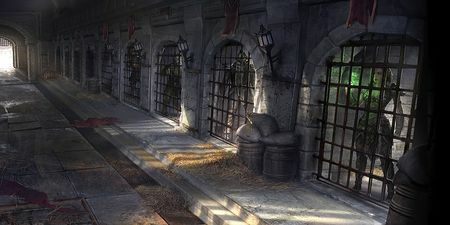 Solo Arena has an independent ranking systems of the other Arenas, though the progression and naming scheme are identical. Upon promotion to Grand Champion for the first time (including Versus Arena), you will receive a premium Adoring Fan. Each opponent, including the boss, is randomly selected from a predetermined pool based on your elo score. Each opponent has a unique deck, a title, and follow a specific theme. There is a 50% chance that one of the non-boss opponents will be a feature match each run. These are opponents that begin the match with a unique scenario, introduction text, and announcer dialogue, but no special lanes or random scenarios can be present. Each feature match can be defeated only once and will then be removed from the eligible pool of opponents. For a list of each opponent and their decklists, see Solo Arena Opponents. Contrary to the information provided by the game, the opponents are not selected based on your rank. Every player has a hidden elo score which can decrease and increase depending on the amount of wins during a run. This does not follow the traditional elo rating system used by other games, because the Arena matches you against an AI. Your first run starts with an elo of 1200 and will change following the table below. The minimum is an elo of 800 the maximum of 2000. You will not lose elo from losing games by itself. The elo score will not be adjusted during a run, only after the run is finished. At the start of a run, your own current elo score is used to determine the opponents that are eligible to encounter. Each opponent has their own elo score that will be compared to your own elo as shown in the following table. The opponent elo scores are listed here. So as an example: if you have an elo of 1200, you will face two weak opponents with an elo between 700 and 900 (-500/-300) and two strong opponents with an elo between 1100 and 1300 (-100/100). Bosses and feature matches are selected the same way as other opponents. The final boss is selected from the same pool as the other 8 opponents, but is made more challenging due to the addition of one of the following Supports in play on their side. Moonstone Relic Breaking your runes will give your opponent a small advantage. This champion is hungry... for blood! Ebony Relic You must break through the City Gates before you can enter the city. Normally I would say "Lower the gates! ", but today it is up to our challenger to knock them down! Malachite Relic Your opponent is in a fortified position, and has defenders already in place. This champion's personal guardsmen will be though to overcome. Iron Relic Your opponent starts at a higher health total. This champion has the constitution of two normal men! Quicksilver Relic Your opponent will slowly deal you extra damage. This champion has shot down every foe he's faced. Hehe... so far. Corundum Relic Your opponent's creatures are unusually strong. Today's champion is renown for hitting especially hard! Haha! This could get ugly, citizens. Each scenario is assigned to ProPlayer (advantage for the player), ProBoth (neutral or advantage for both), ProAiMinor (small advantage for the opponent), or ProAiMajor (large advantage for the opponent). The elo modifier will boost (or lower) the opponent's elo rank, and thus it is less likely that a high ranked opponent will appear with these kind of scenarios. As an example: Flamescale Terror has an elo score of 1300, but with the Ambush scenario it would have been increased to 1400. If your own elo score is 1200, you can never encounter Flamescale Terror with the Ambush scenario (the max opponent elo score is 1300 if you have 1200). However, it is still possible to encounter it as an opponent with the Shields Up scenario. Ambush One of your opponent's creatures gets the drop on you. Opponent starts with a <3-cost card from its deck into a random lane. ProAiMajor 100 Looks like someone got the drop on our challenger! or It's an ambush! What fun. Magicka Advantage You have encountered a powerful mage who starts with extra magicka. Opponent starts with 2 extra max magicka. ProAiMajor 50 This combatant has mastered the power of magicka! Power Struggle The battlefield seethes with mystical power, giving both players extra magicka. Both players start with 1 extra max magicka. ProBoth 0 Can you feel it citizens? There is magic in the air today! That or I've eaten too many sweetrolls. or Extra power for everyone! Resourceful You arrive the arena first and hastily set up some defenses. You start with a 0/2 Makeshift Defenses in your hand. ProPlayer -25 Our challenger has... build some rudimentary defenses! Ha, let's see if it works. Close Quarters A gladiator is ready to face you. Opponent starts with a Crowd Favorite in a random lane. ProAiMinor 25 This fight might just be unfair. Haha, excellent! Duel Each of you warriors is ready for battle Both player start with a Crowd Favorite in opposite lanes. ProBoth 0 They've trapped the battlefield. Can they do that? Yes! Yes they can! Guard Your opponent comes to battle with defenses ready. Opponent starts with an Altmer Protector in the left lane. ProAiMinor 0 An ally? Can they do that? Eh, why not? Shields Up You each come to battle with defenses ready. Both players start with an Altmer Protector in opposite lanes. ProBoth 0 Beware the traps set across the Arena. All Out Brawl Both of you come to battle with bottles at the ready. Both players start with Broken Bottles in play. ProBoth 0 How will our challengers fare in an all out brawl? Hero's Call Three heroes come to aid you into battle. Three random Unique creature cards are shuffled in both player's deck. ProBoth 0 We've some true legends in the Arena today, citizens. Sheogorath's Game Both players start with a mysterious staff in play. Both players start with Wabbajack in play. ProBoth 0 I always said that anything can happen in the Arena, but this time I really mean it! On a Roll Delicious pastries have been provided. Both players start with a Sweet Roll in both lanes. ProBoth 0 Remember citizens, the Imperial Arena is second to none in concessions and snacks. Power Unleashed The battlefield is overflowing with mystical power, giving both players THREE extra magicka. Both players start with 3 extra max magicka. ProBoth 0 We're expecting big things out of this match, citizens. Spawning Pool Slaughterfish are circling their prey. Both player start with a Slaughterfish in opposite lanes. ProBoth 0 We flooded the Arena and filled it... with fish! They're very deadly fish. Hardy This foe is especially hardy. Opponent starts with 5 more health. ProAiMajor (?) You know what they say. The bigger they are the more thrilling it is they fight to the death! The boss battle and feature matches will always have their own scenario without any elo modifiers. All other battles have the following chance to get a scenario. There is no way to determine what opponent is assigned which slot as they are randomly distributed over the opponents. Only the first Solo Arena run will have predetermined slots with Scenarios and Special Lanes (although those are still randomly chosen). The following lanes can replace or found in conjunction with the Field and/or the Shadow lane[verification needed — What's the chance?]. For more information about Lanes, see here. After you summon a creature here, a random friendly creature here gets +1/+1. These gladiators are armed with the best weaponry they could personally afford. At the start of your turn, if you have the most creatures here, deal 2 damage to the opponent. Who will control the mighty Ballista Tower? Let's find out! After you summon a creature here with 4 or more power, draw a card. I'm sure we'll be seeing some heavy hitters in this fight. After you summon a creature here, friendly creatures gain its keyword. These teams have trained together for over 10 minutes. Let's see what they've learned. The first creature here you attack with each turn can attack an additional time. The mightiest will stand alone today. When a creature is summoned here, give friendly creatures in the other lane +1/+0. This should be a rousing test of strategy! Can our challenger outflank their foe? Guards here have +1/+1. Today's arena is a defenders delight! This one could be long and bloody! Creatures with 2 power or less summoned here gain a Ward. Our gladiators are getting thirsty... thirsty for combat! After a creature other than Rotting Draugr is destroyed, summon a 1/1 Rotting Draugr. The Imperial Arena does not condone necromancy, but we do condone entertainment! If there are no friendly creatures here when you summon one, copy it. Can our combatant navigate the confounding Hall of Mirrors? Watch very carefully ladies and gentleman. Creatures here have +1/+0. Today's battlefield has been specially designed for maximum bloodshed. Let the carnage begin! After a creature with cost 5 or greater is summoned here, give it Guard. Can our combatants defend the hill? Let's find out! While you have a creature here, actions cost 1 less. Thee who controls the knowledge controls the power! Creatures summoned here gain a random keyword. Everyone is lucky to fight in the Imperial Arena. Who has the luck to survive? After you play an action, summon a random creature in this lane with the same cost. Imperial engineers spared no expense to add a Mage Tower to today's battle. After a creature is summoned here, attach a random item to it. Today's battlefield is littered with the most deadly weapons we could find. Gladiators, good luck! Creatures here have Regenerate. All combatants should have a chance to heal before they are matched in mortal combat. After you summon a creature here, reduce the cost of a random card in your hand by 1. We give some, they take some... flesh! Let the games begin! After you summon a creature here, gain 1 health. Each Imperial warrior should have a chance to pray... for survival! After you summon a creature here, deal 1 damage to your opponent. Now war... that... is... entertainment! At the end of your opponent's turn, a random creature switches lanes. It's windy today. Hold on to your helmets. After you summon a creature here, transform it into a random Animal. We brought beasts from across the Empire to challenge our contestants! The following is a list of quotes from the Arena Announcer in the Solo Arena. He is voiced by Wes Johnson, the same voice actor as its Oblivion counterpart. Retry lost match Looks like the challenger is eager for another shot at glory. Ladies and gentleman! Our rematch. Open the gates! Boss battle And now the final champion comes forth! The crowd goes wild! Our challenger is ready to face an ultimate adversary. Open the gates! Feature match I can't wait for this to get started. Lower the gates! We've got a special match for you today citizens. Let the battle begin! Today's battle promises be one for the ages. Combatants, good luck! This promises to be among the most exciting matches the Imperial Arena has ever seen! Flanking lane This should be a rousing test of strategy! Can our challenger outflank their foe? Inner Fire lane We're about to see which of our combatants has the true heart of a champion. Who will join our challenger? Which will the challenger pick? Defeated Boss The final foe has fallen! Well done challenger. Defeated Boss with no losses Ladies aaand gentleman! We have... our... latest... legend of the Arena! This page was last modified on 17 April 2019, at 13:07.